Kasey, a 5 year old female Schnauzer, presented on 8/29/18 initially to our CARE emergency service. 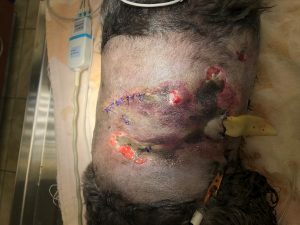 Kasey was attacked by a large German Shepherd and sustained bite wounds to her left thorax. CARE took Kasey to surgery where her wounds were cleaned, sutured, and a drain was put in place. 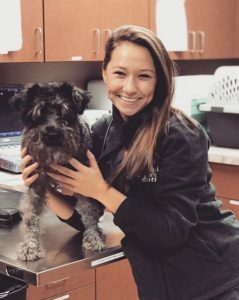 On 8/31/18, Kasey presented for a recheck with Dr. Kanak. 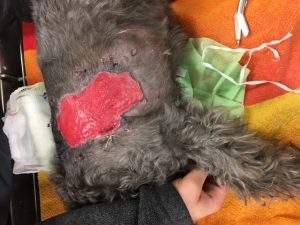 There was significant bruising around both sutured areas, and Dr. Kanak expressed concern for the health of the tissue and having to take Kasey back to surgery. Kasey, happy & healthy today! On 9/2/18, Kasey presented for a recheck and drain removal with Dr. Kanak. At this point, Kasey’s skin was discolored, and it was clear that there was a predominant infection. Kasey was taken to surgery. 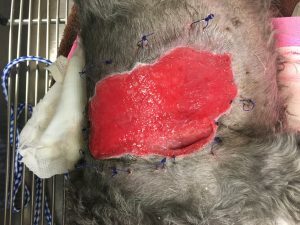 Due to the close proximity of both bite wounds and the unhealthy state the tissue was in as a result of infection, a large portion of the skin needed to be removed and the area needed to be managed as an open wound. 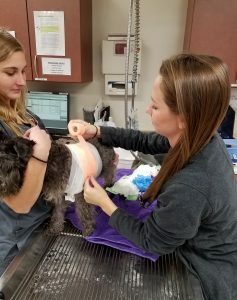 Kasey’s owners were very committed to doing everything to help her, including bringing Kasey in for her bandage change every day! 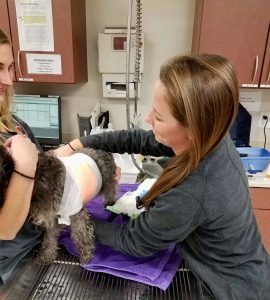 Every day Kasey would receive a new bandage, laser therapy, and wound management. 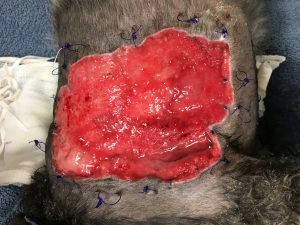 Kasey’s wound is healing great and every day we notice an improvement and a significant decrease in the size of the wound. On 10/4/18, we discontinued daily bandage changes and allowed Kasey’s wound to remain uncovered. 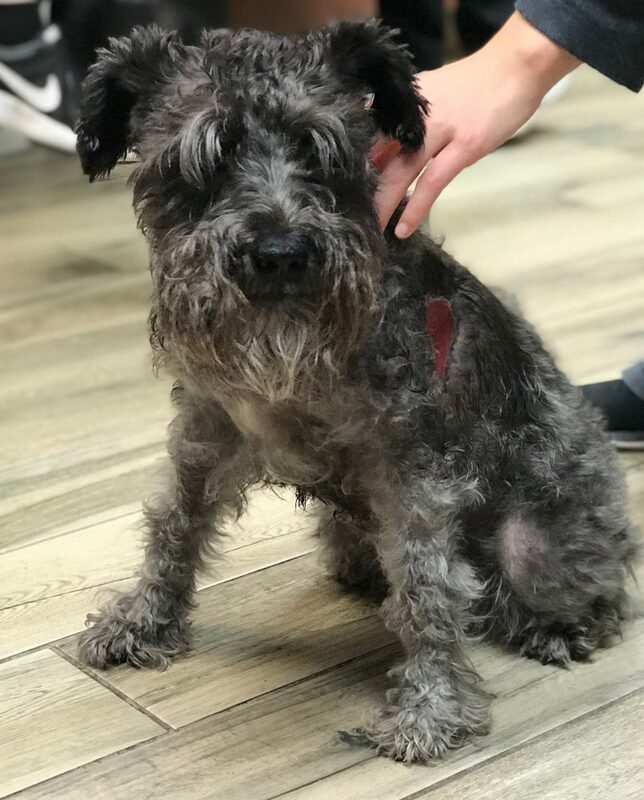 Kasey has been doing great with her recovery, and we can’t wait to see her for a recheck when she is fully healed!